Just how good is your printer/ icc profile? This target represents what should be printable by any good printer. Try it out as it will provide some helpful insight into the quality of your profile (icc) and give you a better understanding of your selected papers print surface resolution index (PSR). This target is intended only for personal use. For more information please contact me. Copyright Indian Hill Imageworks, 2008. What to look for. No breaks in the color bands or quick ramp on either end…should start and finish very smooth. 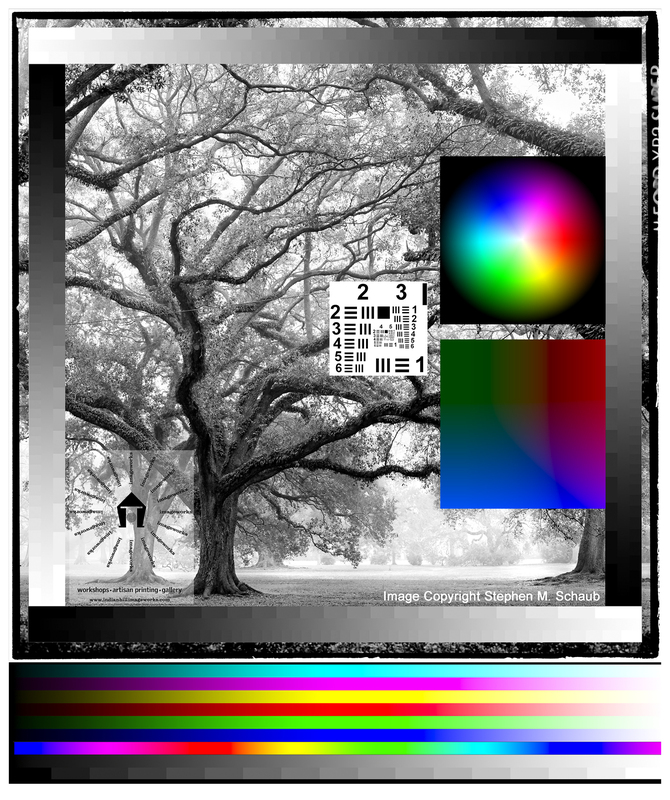 The tree image should be perfectly neutral (check under different light sources.) The color rainbows (Granger Charts) are really not printable (perfectly at least) but they should be as smooth as possible with no breaks or jumps. The resolution target (look at with 4x print loupe) and with the unaided eye…how low can YOU go! The grayscale ramp should show seperation from 100% -0 – the last patch just before black should be visible…also check for dots in the lightest patches…dots are BAD.